Ministries of the Sisters of Charity of Seton Hill are informed by Gospel values, responsive to the needs of a changing world, and guided by the prudent use of available resources. As we work to continue the mission of Jesus, we bring the message of peace and love to all people through building right relationships with all creation. The Eco-Justice section of our website is intended support a deeper understanding and respect of the inter-dependence of the ecosystems that comprise the earth and to promote good stewardship of earthly resources. The recent report of the UN’s Intergovernmental Panel on Climate Change warns that the climate crisis is growing faster than previously predicted. The UN identifies deser- tification in Mongolia and several other areas of the world as threatening the entire global ecosystem, with 50% of Earth’s land area turning to desert by 2100 unless the world drastically and quickly reduces carbon emissions. The pace of desertification in Mongolia is shown below. 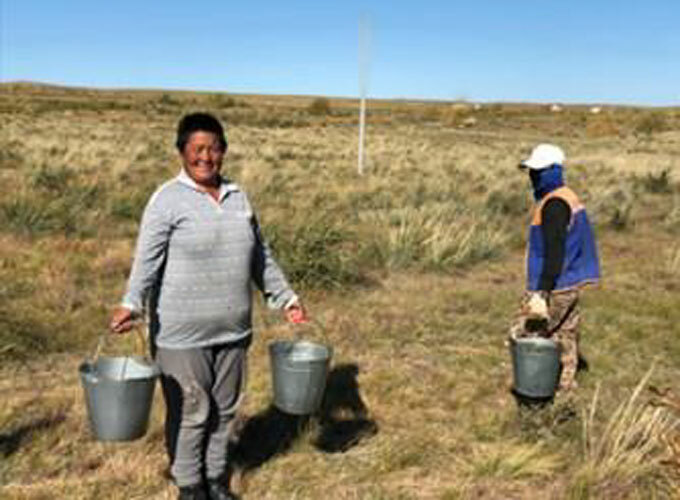 The Interprovincial Laudato Si’ Committee challenges the Sisters of Charity in the U.S. and Korea, and our friends and families to plant trees in Mongolia. We build on the Season of Creation Campaign of UISG (the International Union of Superiors General) in coordination with the Global Catholic Movement. The U.S. Province of the Sisters of Charity will send donations through the Korea Forest Service, which has a long-standing relationship with Mongolia in the effort to reduce desertification. Read more about theses efforts and to make a donation to plant a tree. These and other “green” issues shape the ministry of Sister Mary Elizabeth Lawrence, Directory of Pastoral Care at Our Lady of Perpetual Help Parish and Eco-Justice coordinator for the Sisters of Charity of Seton Hill. She is also Co-Executive Director of Arizona Interfaith Power & Light (AZIPL), an interfaith ministry devoted to deepening the connection between ecology and faith. 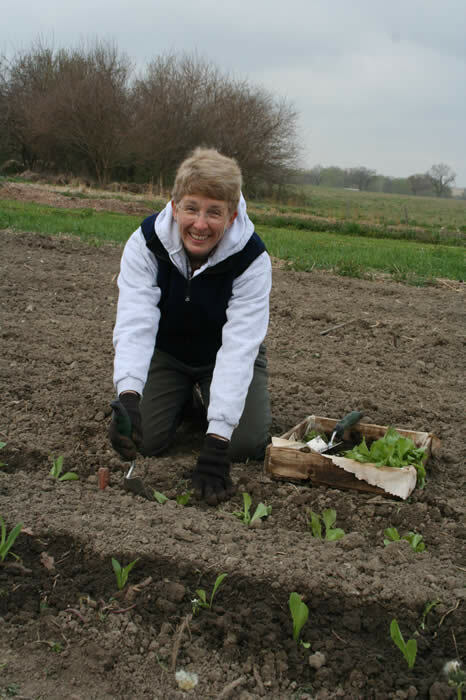 Sister Mary Elizabeth works to increase awareness about everything from water use to light bulbs to local and international efforts to protect the earth and help people recognize and fulfill their responsibility for the stewardship of our planet. In a cactus-dotted desert of Arizona or a hemlock-shaded woodland in Pennsylvania, Sister Mary Elizabeth prays and works to guarantee a sustainable future for generations to come. Beyond the study and dissemination of practical information about ecological issues, she also introduces her audience—the sisters, schools, parish groups, and this website audience—to the compelling reasons to see all of the earth and its inhabitants as part of one living and endangered system. Energy audits—save energy, save resources, save money! Like charity, good stewardship of earthly resources begins at home. Sister Mary Elizabeth has conducted energy audits at the Pennsylvania residences of the Sisters of Charity in Greensburg and Pittsburgh as well as at Caritas Christi and the DePaul Center offices. 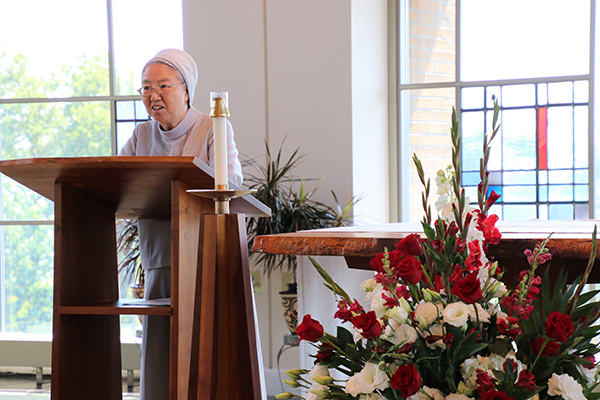 Sister Mary Elizabeth began each meeting with prayer and explained the environmental impact that can be made individually and communally by implementing energy efficient practices at home and at work. An evaluative walk through each house or building provided opportunity for Sister Mary Elizabeth to identify energy wasting target spots and make recommendations for improvements. Suggested practices included the use of energy efficient light bulbs, such as CFL and T-8 florescent lighting; use of aerators at each faucet to reduce the flow of water per minute; use of surge protectors with switches to turn power off when appliances are not in use; and use of weather stripping to seal air leaks at doors and windows. Sister also recommends proper disposal of mercury containing light bulbs and battery recycling. Renewal Center – Sr. Mary Elizabeth Lawrence works with a team to improve energy efficiency, install solar panels, replace plastics and Styrofoam with recyclable products, provide educational events, gather signatures on climate petitions, and promote advocacy. Sisters Sharon Carpenter and Edie Strong work with a team to improve energy efficiency, replace plastics and Styrofoam with compostable products, provide educational opportunities, promote advocacy. Sr. Edie Strong works with a team for the same purpose. Sisters Barbara Smelko, Jean Augustine, Sharon Carpenter, and Edie Strong work with a handful of environmental enthusiasts and the Sierra Club of Allegheny County to organize the beginning of the Sierra Club in Westmoreland County. Their first effort is to influence the implementation of the Development Plan of Westmoreland County to maximize environmental sustainability. Sisters Sharon Carpenter and Mary Elizabeth Lawrence both took time to study and reflect Upon ecological issues of today, the impact of human activity on the environment, and the need to change the course of global warming. Learn how to conduct a home energy audit. Learn how to safely clean up broken bulbs, and dispose of or recycle fluorescent bulbs. Learn more about safe use and disposal of mercury containing batteries and other mercury containing commodities.